Taylor, or Taylor Guitars, is one of the world-class leaders in the guitar manufacturing industry – it’s not a coincidence that we’re so interested in pitting their finest models against each other, as these guys aren’t capable of making a bad guitar. That being said, you’re in for a real treat if you’re looking for a premium-quality professional-level acoustic guitar. Taylor Guitars brand was founded in 1974 by Bob Taylor (along with Kurt Listug) in California, and they’ve done one hell of a job during the course of the past 40 years. You might recognize some of the people who used Taylor guitars – Prince, Steve Chapman, Jason Mraz, and even William Ackerman. Now that we’ve piqued your interest, let’s discuss the aforementioned guitars in more detail. Actually, Taylor’s guitars are divided into 100s, 200s, 300s, and similar series, so 114 belongs to the 100s, 214 to the 200s, and so on. Even though this might lead some people to believe that there’s absolutely no correlation between these three guitars, the truth is that they’re very much alike. However, the differences between them make them perfect for this versus match – the 114CE is among the most affordable high-end Taylor guitars, the 214CE is, perhaps, the most versatile and well-rounded one while the 314CE is, though the most expensive one, the finest Taylor Guitar in this roundup. Some people are bold enough to label these three guitars as “Lower-end Taylor acoustic guitars”. That’s somewhat true – it was only until recently (2003, precisely speaking) that the cheapest model from Taylor Guitars featured a cost of $1000. If you’re new to acoustic guitars market, that’s a lot. The 100s series starts at $700, the 200s at $900, 300s at $1500, but there’s a good reason why their guitars are so expensive. Namely, Taylor acoustic guitars excel in every single field of performance – sound, intonation, reverberations, durability, outlook, you name it. The single most frequently used arguments of people who are comparing the 114ce to 214ce and 314ce is “there’s a huge difference in price, tone, and quality between them, what makes them so different?”. We’re here to shed some light on that issue. Even at first sight, Taylor’s 114CE is absolutely ravishing. It looks phenomenal and features a single-cutaway “Grand Auditorium” design. There’s a neat black pickguard right next to the soundhole, which makes it excel in aesthetics even more. There’s a total of 20 frets which feature conventional dot inlays (3rd, 5th, 7th, 9th, 12th, 15th, and 17th) and a scale length of 25-1/2”. It comes pre-strung with Elixir Phosphor Bronze strings which hold the tune exceptionally well. 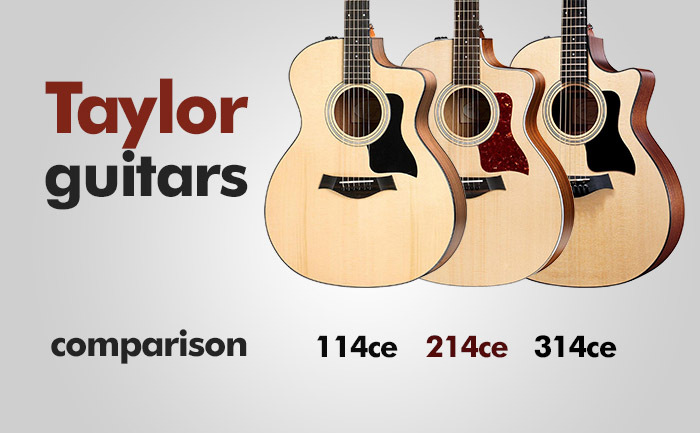 Overall, Taylor’s 114CE is designed in a rather plain, straightforward fashion. It looks quite amazing, although the majority of Taylor guitars look very much alike. Taylor’s 114CE is made of premium-quality materials, but the same can be said for all Taylor guitars – it features a high-quality Tusq nut and Micarta saddle, a plastic truss rod housing, chromed tuners, ebony neck (with Sapele finish), and a varnished peghead finish. Most people characterize Taylor’s 114ce as highly durable and exceptionally playable – the strings it comes with are very great, the tonewoods are nearly flawless, and it’s safe to say that this is one of the best lower-end Taylor guitars ever made. The chromed tuners on this guitar hold the tune quite well, but that’s not the only factor that’s “responsible” for Taylor’s 114CE’s awesome playability. Namely, the beautiful design isn’t just for show – the neck’s properly aligned and inserted with great care, the action is just great, and it’s safe to say that you’ll have plenty of fun playing this guitar. Taylor’s 114CE is the least expensive guitar among the three we’re reviewing, but it wouldn’t pass as a “cheap” guitar per se. Namely, it belongs to the medium bracket of the “mid-high” price point category, and it costs quite a lot when compared to average boutique acoustic guitars. Next up’s Taylor’s 214CE – this is a remarkable instrument that holds a substantial value for the buck for many reasons. First of all, it comes supplied with a high-tech set of features. What’s more, it doesn’t cost too much when compared to 114CE, and we’re here to see what it can offer you. Just like Taylor’s 114CE, the 214ce features a single cutaway “Grand Auditorium” design. There are a lot of obvious similarities between these two acoustic guitar models, but there are a couple of easily noticeable differences. For one, this guitar features a more natural finish. The 114ce had a black pickguard, and this one features a red one, but the most apparent difference between these two is the option to choose between two color styles. The first is rightly labeled as “natural” while the second is, in our humble opinion, even more beautiful, bearing the title of “Sunburst”. It looks classy and slick, no matter how you look at it, and it’s safe to say that this particular model is the best looking among the three in this versus match. As stated on Taylor’s official website, the 214ce “features an aesthetic update” – namely, the back & sides are made of Hawaiian Koa material, which is exotic and superbly looking, if nothing else. The top features Sitka Spruce materials that heavily increase the range of dynamics, and you can easily spot the exquisite white binding which serves a purely cosmetic function. The peghead overlay features premium-quality ebony materials while the back boasts a Satin finish, making the glossy top the second-best looking feature onboard. When compared to the 114ce, the 214CE Taylor acoustic guitar doesn’t feature any notable improvements in the field of playability. The internal bracing gives a massive boost to the sound, and the outer materials look a bit better, but everything’s basically the same – it’s easy and fun to play this guitar, but if you value playability above all else, the 114ce would do the same job. As it’s only normal, improved and newer models from the same brand usually cost more than their predecessors. Such is the case with 114ce and 214ce, but the difference in price is more than noticeable. The 214ce is in a totally different price point category, exiting the range of entry-level guitars and going toe to toe with the boutique level ones. We’ve already mentioned that Taylor guitars are a bit more expensive than your average acoustic axes, but this particular model is hardly inexpensive. Taylor’s 314ce is the last “CE” guitar we’re reviewing, and it’s easy to see why it has a lot of proving to do. Both 114ce and 214ce are awesome and excel in numerous fields of performance, so it’s only normal that 314ce should outshine them both. Let’s see if it can do just that. A simple, brief glance at the design of 314ce can tell us a lot of things. No, it’s not beautiful – it’s breathtaking. The improved aesthetics of 214ce pale in comparison to this model as virtually every aspect of this single-cutaway guitar screams “quality”. It looks so good that words can hardly describe it but it doesn’t lack in performance one bit for that matter. This is the part where it gets interesting – any laymen could hazard a guess that 314ce and 214ce look practically the same. That, of course, couldn’t be further from the truth. With a genuine ebony fretboard, a Tropical mahogany neck, and all-wood construction, this is, by far, the most durable Taylor guitar in this review. What’s more, the hand-picked tonewoods buff up the sound quality in a particularly substantial way. Even though the scale remains the same, 314ce brings a bunch of innovations onboard. Most players report that the frets on this model feel gentler, the strings vibrate more pleasantly, and the guitar stays in tune for extended periods of time. That, of course, means that the level of playability 314ce boasts can’t even begin to compare to the earlier versions of this guitar. Let’s put it this way – the difference in price between 114ce and 214ce is the same as the difference between 214ce and 314ce (give or take a few bucks). That means that its value is sky high, but if you deem 114ce as “expensive”, you’ll think that 314ce costs a fortune. Into the fray! Which Taylor guitar is the best and for who? We’ve run over the most notable and important highlights of 114ce, 214ce, and 314ce – it’s time to decide which of these acoustic guitars is the best. Taylor makes premium-quality guitars, and that’s a fact. However, some are better for beginners while other models are best suited for veterans and professionals. The 114ce is, undoubtedly, the best beginner-friendly acoustic guitar on the menu. It doesn’t cost too much, it features a plain design, and its playability is beyond average. Taylor’s 214ce, on the other hand, is in the golden middle regarding the price, it features a huge value for the cash, but it doesn’t really feature major improvements in regard to playability, so it’s also pretty good for beginners. Professionals often favor the 314ce because of its improved playability and sound quality. If you want a good-looking guitar, choosing between 114ce, 214ce and 314 will most certainly be hard for you. All three of them excel in aesthetics, but 214ce more than others. The 114ce looks plain and it features the most neutral finishes – it’s certainly the most straightforward acoustic guitar among the three. Secondly, the 214ce can be declared as the most beautiful due to the Sunburst finish (optional). Even in its “natural” variant it still looks a bit better than the other two. Lastly, the 314ce looks plain amazing – the finishes are on point, the tonewoods look and feel very vivid, but it can’t compare to the “Sunburst”, hence the 214ce is the most beautiful Taylor’s CE guitar. This round has a pretty obvious outcome. The first in the “CE” line is 114ce which sounds surprisingly good, given that it’s the most affordable of the three. The chrome hardware holds the tune quite well and the setup is fairly good. The 214ce is more of a cosmetic upgrade of its predecessor, so it sounds basically the same as 114ce. Lastly, the 314ce brings a lot of innovative features onboard, and it most definitely sounds the best. It costs the most, though, but it wins the round. All three of these guitars are made of exotic materials. That, however, doesn’t mean that they’re flimsy – that means that they’re all exquisite, to say the least. The 114ce features Sapele Laminate back and sides, solid Sitka spruce top, and a plastic soundhole. It’s quite durable, but can’t compare to the other two in this field. Taylor’s 214ce comes outfitted with ebony fingerboard, Rosewood binding, and layered rosewood back and sides. Its top features Sitka Spruce materials, just like the 114ce, but it’s substantially more durable than the latter. Now, the 314ce comes equipped with the finest hand-picked materials, so it’s pretty safe to say that it’s the most durable acoustic guitar in this matchup. It’s pretty hard to determine which Taylor acoustic guitar is the best one for the buck – all of them are genuinely valuable and remarkable. When you’re in doubt which one is the best for you, you should begin with the price – the 114ce is the most affordable, and 314ce the most expensive one.